Before the surgery I was lucky if I could stay awake during work, or could make it up the stairs without passing out from lack of oxygen. I was not very active. I was a pro at sitting on the couch and doing nothing. I did the least physical labor possible due to my low self-esteem and lack of energy. I felt as if I had given up. I had quit smoking a few years prior and thought that that would help; however, although it did help some, I was still gaining weight. I was unhappy with myself and my life. I have always been the plus-sized girl, always in the back of the room trying to hide. I was watching others and wishing I could go shopping like everyone else. I spent most of my life larger than what I wanted and never feeling that I could be who I wished to be, since I lacked confidence in my own skin. There came a time when I was not able to keep up with my then 3-year-old son and decided he deserved to have his mother around and he deserved to be happy. And I deserved to be reborn. I decided that it was time to sink or swim. Do or die. This was for me and my son. I have never had an experience like I did at Barix. The building was clean, comfortable and welcoming. I felt at home. I felt cared for. I felt like family. The nursing staff was second to none. I had never experienced a nursing staff that was that attentive or accommodating. The nurses were helpful and funny and knew how to make a person feel welcomed. Each nurse was able to explain what was going on and how long things should take; and they were there when you needed them, without hovering. My surgeon was exceptional. He was able to answer anything and give me pointers too. I felt at home. I felt cared for. I felt like family. I am more active than before and have learned that I still have some fight in me. I have changed my way of life altogether. 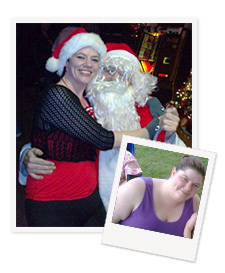 I help others with making good decisions about their diet and even educate others with new information I have learned. I can do more with my son. We go to the park, go on walks, and go shopping. We play. I have gained a whole new perspective on life and on myself. I can do this and keep going.